Toshiba is suing Western Digital for 120bn yen ($1bn; £835m), accusing it of interfering in the attempted sale of its flash memory business. The Japanese giant is offloading the unit, which makes chips for smartphones and laptops, to cover huge losses in its US nuclear division. It has so far failed to clinch a sale to its preferred buyer, a group of US, South Korean and Japanese investors. Western Digital, a partner of Toshiba, objects to that proposed deal. The US firm, which jointly runs Toshiba's main semiconductor plant, has been feuding bitterly with its Japanese partner, and has sought a US court injunction to prevent any deal that does not have its consent. Toshiba said Western had "continually interfered with the bid process" and "exaggerated" the amount of say it had in whether any sale went through. It also announced that it had decided to stop Western Digital staff from accessing information about the two companies' joint venture. 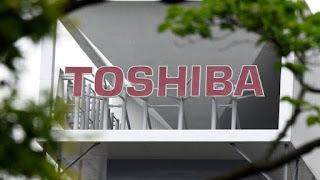 Earlier on Wednesday Toshiba said it had failed to complete a deal to sell the chip unit to a consortium of US, South Korean and state-backed Japanese investors, reportedly worth about $18bn (£14.1bn). It had hoped to seal the sale before its AGM on Wednesday. On Tuesday, Western resubmitted its own bid for the chip division, which had been unsuccessful first time around. Taiwan's Foxconn says it has not given up on buying the chip unit, despite it also having a bid rejected.